Situated around four and a half miles to the south east of the spa town of Buxton, Chelmorton bears the distinction of being the highest village in Derbyshire. The village was a Saxon settlement originally called 'Chelmerdon' and is mentioned in the Domesday Book. The church of Saint John the Baptist (pictured right) dates from the eleventh century, an unusual golden locust sits on a weather vane above the spire, a reference to St John the Baptist survival in the wilderness on a diet of locusts and honey. The church bells were rescued from from the church at Derwent, before the valley was flooded to create the Ladybower Reservoir in the 1950s. The Chelmorton Tapestry, a series of framed panels depicting the history of the area from pre-historic times to the present day, is housed in the chapel in the south aisle. The oldest dwelling in the village, characterful Townend Farm, was built by Isaiah Buxton in 1634. The building has four Venetian windows and an enclosed courtyard with elaborate outbuildings. Known locally as Chelmorton Hall, it was the family seat of the Marsden family. The Chelmorton Troughs are the last surviving pair of an original seven, which were once located down the west side of Main St. The water originates from a spring at the foot of Chelmorton Low which rises to 446 metres, (1,463 feet) and originally ran through the village as a stream known by the quaint name of Illy-Willy-Water. When the troughs were installed, they were connected by channels to improve the flow of water, which eventually disappered down a swallet hole at Townend. The Chelmorton Pinfold was used to hold stray cattle until the end of the nineteenth century. The village pub, the ivy clad Church Inn, (pictured left) dates back to the early eighteenth century and is situated opposite the church, it was originally called the Blacksmith's Arms. 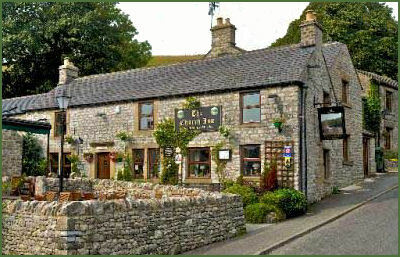 The pub offers Bed and Breakfast accommodation and good home cooked food. 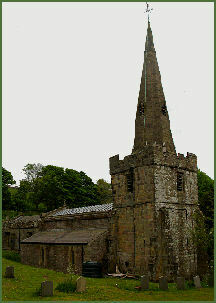 Chelmorton was the home of Harry Swindell, a local farmer, poet and author who wrote about the area. Some of his verses can be read on the walls of the dining area in the Church Inn. In the early nineteenth century the inn was the home of Alexander Ollerenshaw, a local eccentric who the local parish register records "An ingenious Blacksmith and Musician, and having more than 50 years vainly endeavoured to find out perpetual motion"
The field pattern around the village, of Medieval strip fields, where the villagers each owned strips of land, has remained unchanged for centuries and may even date back to Celtic settlers in the area, the strips rise up the hill and radiate horizontally from the village main street, in addition, an earthwork mound and ditch almost encircles the village. There are a number of Bronze Age tumuli on the summit of Chelmorton Low and the nearby Nether Low. The two well preserved round barrows (OS grid ref- SK 114706), or burial mounds on the western side of the Chelmorton Low are around 10 metres wide, 1.5 metres high and stand 37 metres apart. The north east barrow was excavated by the archaeologist Thomas Bateman in 1846 who unearthed a number of flint artefacts and evidence of a cremation. Excavations of the south west barrow took place in the early 1780's, which contained the remains of perhaps 5 burials and revealed a cist in the north-eastern edge of the mound. Directions- From near the Church Inn at Chelmorton take the left hand bridleway and continue straight up the hill. The Nether Low barrow (OS grid ref- SK108691), which faces Chelmorton Low, is circular and has a diameter of about 20 metres. The barrow was excavated twice by Bateman, five burials in all were discovered. Among the numerous grave goods recovered were a spear head, a flint tool and a serrated knife. Five Wells chambered cairn (pictured right), is situated high on Taddington Moor (OS grid ref- SK124711). The cairn dates from the Neolithic era. Standing at over 430 metres (1,400 feet) it is thought to be the highest such monument in England. 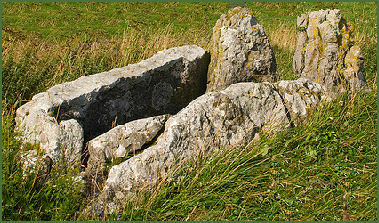 It would originally have had two chambers constructed from large stone slabs, which faced each other back to back, only one of these chambers now survives, the eastern chamber, which consists of two upright portal stones measuring around 1.5 metres in height, behind these are 2 large slabs of stone of around 2 metres in length and a smaller backstone which is a metre wide, the other chamber is in ruins, only the collapsed portals of this chamber remain, one of which is broken, the other stones which once made up the cairn have been removed. The entire monumentt would have been covered with a mound of earth and may have had a kerb of stone. The monument was excavated by several nineteenth century archaeologists, including Thomas Bateman in 1846, human bones, comprising 17 individuals in all were unearthed along with flint arrowheads, animal teeth and a flint knife. There are excellent views across the Wye Valley, Chee Dale Minninglow, Eyam Moor and Stanton Moor from the site. Directions- From the Church Inn in Chelmorton, go up the hill to the walled track which winds its way above the churchyard past the village spring along the line of an old lead rake, marked by various bumps and hollows, to the southern side of Chelmorton Low. Where the track crosses the Pilwell Gate bridleway, turn left up the lane until you reach the edge of the Five Wells escarpment, overlooking the A6. Here a sign leads right along a path to the monument. Three Shires Head, is a beauty spot where the three counties of Derbyshire, Cheshire and Staffordshire meet is a short walk from the Wildboarclough. Macclesfield Forest, once the centre of a Royal Forest created by the Norman kings for the purpose of hunting game such as deer, wild boar and wolves. It once encompassed all the area from Disley to the River Dane. The forest is home to a herd of red deer, while the reservoirs contain a wide variety of wildfowl. Shutlingsloe is the third highest peak in the Cheshire (Shining Tor being the highest and Whetstone Ridge the second ) with an elevation of 506 metres (1,660 feet), the summit offers excellent views. On a clear day the mountains of North Wales are visible from its summit. Chee Dale, a spectacular winding gorge, situated on the river Wye around 3 miles to the east of Buxton , the dale is flanked by majestic sheer grey cliffs and imposing crags of carboniferous limestone which soar to 300 feet in places.